If you have more than one Command Station you can use this field to link this sensor with the CS you actually wired it with. Use with care! The UID is case sensitive and must match, otherwise the sensor event cannot be processed and will be lost. 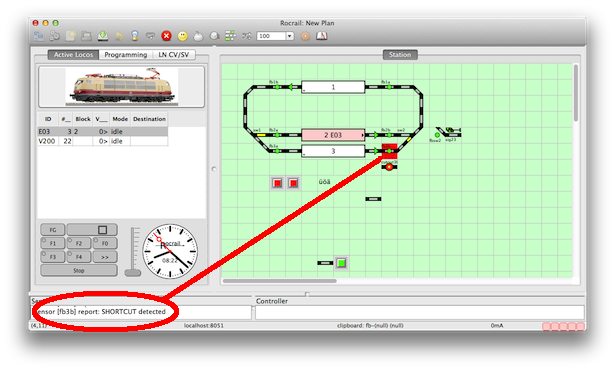 Only for small layouts because of performance penalty. Optional, not supported, offset variable. The value of the variable will be added to the sensor address. Optional for sensor type register only. 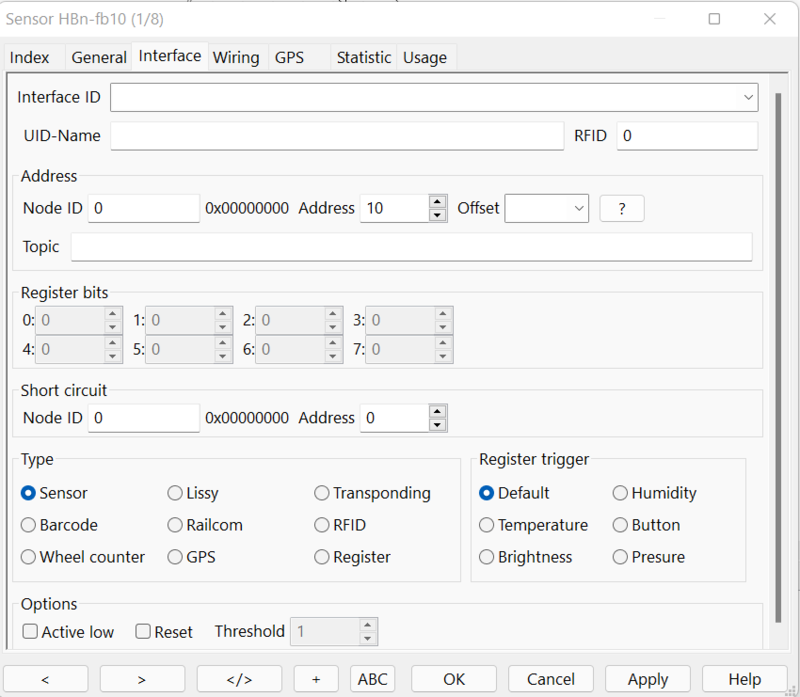 If the used Command Station does not natively support register sensor, it can be simulated with max. 8 register bits. A register bit is just an address of a normal sensor. The register value is after every change event of one of the bits re-calculated. The register value can be used for turntable position or action control: regval. Optional cutout address for detecting a short circuit in this section. 0 Current sensors - Most commonly used; Can also report bi-directional information; Also for Hall Sensors when not used as wheel counters. 1 IR Lissy Uhlenbrock Can be used with the Off timer to get it unoccupied. 2 Transponding receivers Digitrax Not used; Same as type=0. 3 Barcode BarJut Not used; Same as type=0. 4 RailCom - Not used; Same as type=0. 5 RFID MERG, LDT Not used; Same as type=0. 6 Wheel counter GCA173 Hall Sensors, GCA141 Used for wheel or car counting. 7 GPS GamesOnTrack Using the GPS coordinates on the GPS tab. Read Bi-Directional Communication for more information on this topic. Sensor has the signal inverted and can be reverted with this option. For type Wheel Counter GCA141 only! Do not use in case of software counting. Send a reset switch command with the same address as used for this sensor on a reset counter event for GCA141. Attention : The sensor address in this case must not be the same as the one of an existing switch! The minimal value to signal the sensor high in case of type register.